Too often, though, the significance of July 1 is lost, or overlooked. It’s not just any holiday, it’s Canada Day, a chance to celebrate what it means to be Canadian. This is not as easy as it appears. As Canadians, we tend not to go in for jingoism or fervent national pride. We’re well aware of our problem areas, our shadows. Sure, there are fireworks (literally, in some places), but we tend to be thoughtful about what Canada means, what Canada is. The other thing we tend to do is celebrate year-round, in our own low-key way. Look at the arts. We’re talking about a nation unified in its support of Tragically Hip singer Gord Downie following the announcement of his cancer. And we’re a nation that regularly has writers appearing on the shortlists for international prizes. But even that is somewhat ridiculous—we don’t need international recognition for our writers; we know Canada’s literature belongs on the world stage. It’s a given. More importantly, and crucially, we’re a nation that supports our writers at home, through our bookstores. It’s not just Canada Day—365 days a year Canada’s independent booksellers are leading the cheers (subdued cheers, Canadian style) for our writers and their books. But Canada Day IS a special day, so this month, we have a special Canada Day edition of the Shelf Talkers column, an oversize special, with booksellers from coast to coast talking about some of their favourite Canadian books. This weekend, take some time and visit your local independent bookseller. Thank them for all they do. Ask them what they recommend, and buy a book or three. Then raise a glass, and watch the fireworks. Flickers is a deliciously creepy, atmospheric mystery for young adults. In 1920s Hollywood, two sisters are drawn into the dark world of the mysterious director, Mr. Cecil. As one pursues a career in the new talkie films, her more bookish sister becomes intrigued by the director himself, and the death of their parents. I read this book compulsively in one sitting, enthralled with the setting and the relationship between the two sisters. Once you’re a chapter in, you won’t be able to put this one down. Lovers of Stephen Leacock and Robertson Davies will recognize Hodgins as their literary offspring. When the quirky characters in this story steal a 1930s hearse and begin their leisurely journey to the city to claim the body of a recently-deceased friend (and perhaps, for one of them, to rekindle a long-ago romance) nothing goes as planned. This funny, heart-warming story is infused with the essence of rural Vancouver Island life, and a wonderful introduction to Hodgins' writing that will likely send first-time Hodgins readers looking for more. In Oscar of Between, Betsy Warland invents a new form to tell the story of Oscar, a "person of between," who others often regard as a man, other times a woman. Oscar, the name, is the one overtly fictive device in this unconventional memoir that blurs the boundaries of poetry, essay, and biography. The book comprises sections anchored by geographical locales: Victoria and Vancouver, Bath and Berlin, Montreal and Mexico. Though Oscar is prone to trotting the globe as a reader, writer, parent, and friend, she grounds the narrative in the recurring motif of camouflage—an apt metaphor to use when dealing with conceptions of identity. A stunning, thoughtful, and poignant book...long live betweeness! Absolutely LOVED this quirky family—think The Corrections, Canadian-style. By golly, they're from THUNDER BAY! And while everything about this book sounds like a comedy, the comedy is dark and shelters a beautiful and poignant story at its heart. Do yourself a favour... get to know the Parkers this Canada Day. This extraordinary novel covers a fascinating time in 1880s London and diamond mining in South Africa. Spiritualists, and an elusive thief, a Pinkerton detective, a love story, all woven together in a an atmospheric story that readers of historical fiction will be able to sink their teeth into. Coming in August! The Sea Among Us is an essential addition to the bookshelves of anyone interested in BC history or marine life. 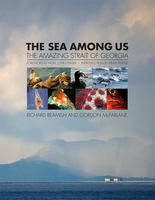 In this first comprehensive look at the Strait of Georgia, readers are treated to an informative and entertaining look at one of the world’s great inland seas. From history to geology to in-depth information on marine life, and packed with full colour photos, readers will return often to The Sea Among Us. This novel is a wonderful tribute to lifelong friendship. It is full of life with all of its messy bits. Through the alternating voices of main characters Katherine Goodnow and Mahsa Weaver, we learn about their early lives and loves, trials and tribulations, and how they meet. Their relationship starts near the middle of the book when they meet at a jazz club in '60s New York City. They are brilliant pianists, and this love of music, and each other, becomes a touchstone for them both throughout the rest of their lives. This friendship helps them make some sense of the other parts of their lives. It gives them the ability to hope things will get better. The music is also a huge part of this book, and it saves them by giving them an escape and a fulfilling passion. I would recommend this book to everyone who loves jazz. Given the chatter over the state of print culture over the last few years, it’s natural that booksellers have been on the front lines of the tumult over digital reading cutting into print sales, the idea that long-form narrative has less of a place in today's distracted age, and well, the death of bookstores. Coady, a top-of-the-mark novelist and television writer, has a foot in both worlds and is canny enough to know that a writer has to wear more hats than they once did to make a living wage (especially in Canada). She is also a realist as to the relatively small slice of the population that even thinks about the topic. The gist of Who Needs Books is simply that, those that still do always will and that they aren't going anywhere. One can quibble over the details (as I do) but this is a needed tonic to all the fear out there that we're all going to trade in our libraries for Netflix accounts. We can use a populist misanthrope in our midst and Lynn Coady's Who Needs Books is both provocative and welcome.